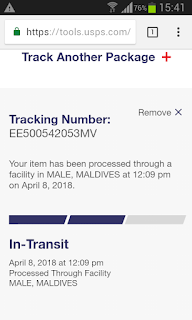 Maldives Post is a Maldivian government owned company providing postal services to Maldives...United States Postal Service® (USPS®) is US federal government owned agency providing postal services within the United States of America ...EMS (Express Mail Service) is courier/accelerated mail delivery service offered by the Universal Postal Union for it's member countries. 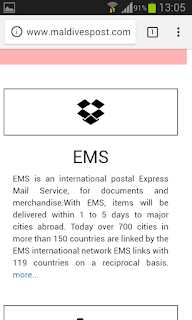 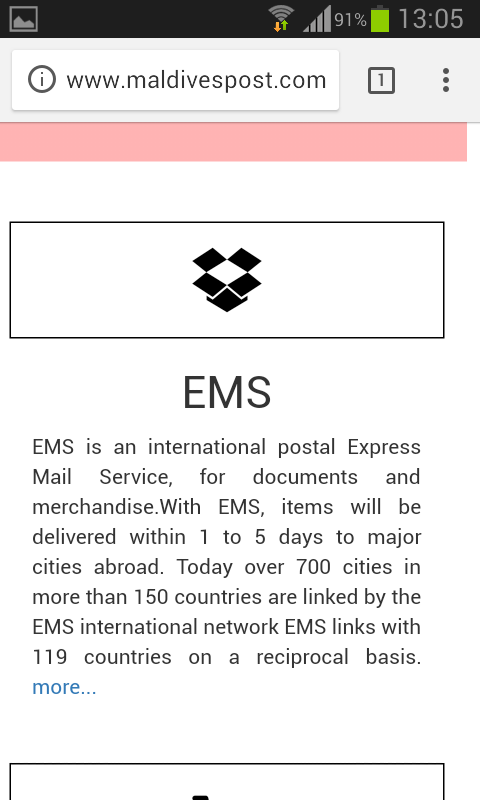 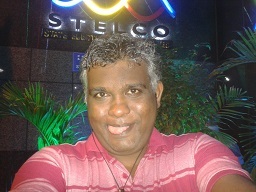 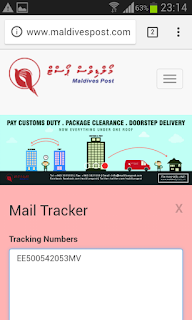 Both Maldives and United States of America is member countries of the Universal Postal Union. 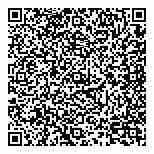 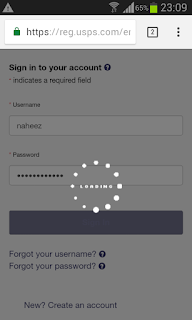 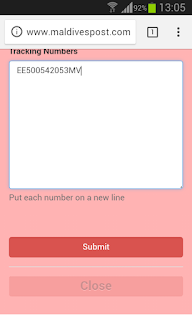 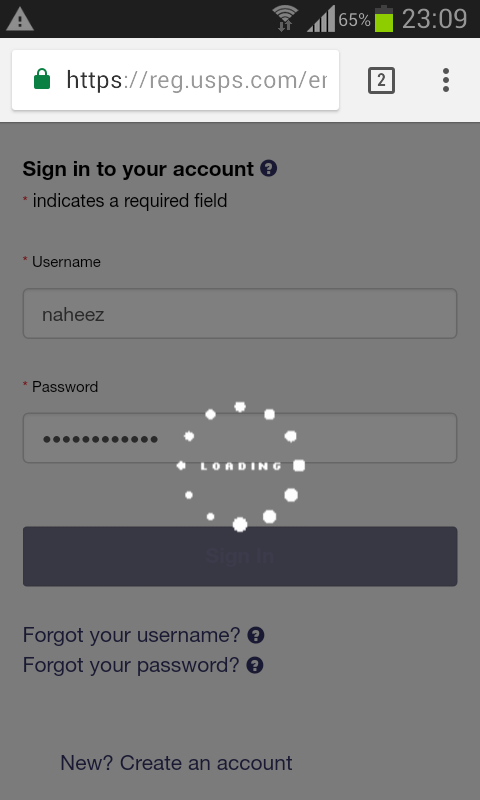 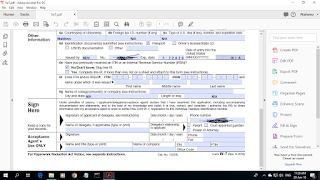 On Sunday 8 April 2018 I remotely attempted my first ever tax registration. 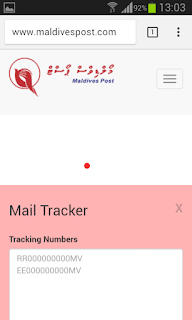 I submitted the W-7 form of Internal Revenue Service, which is US federal government office which comes under Department of Treasury (corresponding Maldivian office is Maldives Inland Revenue Authority), responsible for collection of tax returns from both US citizens and non nationals of USA. 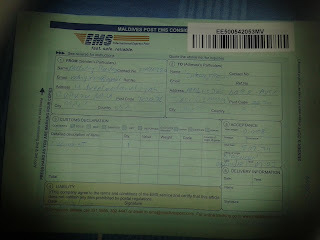 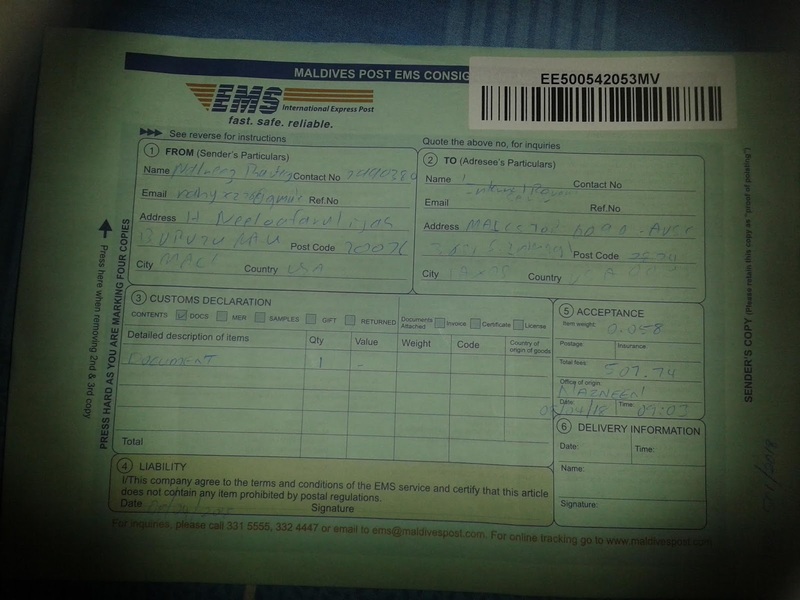 I submitted my original passport and W-7 form to the EMS counter at Maldives Post and it costed 508/- MVR. 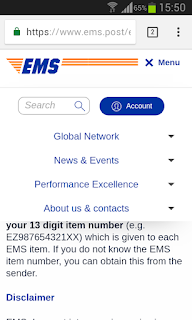 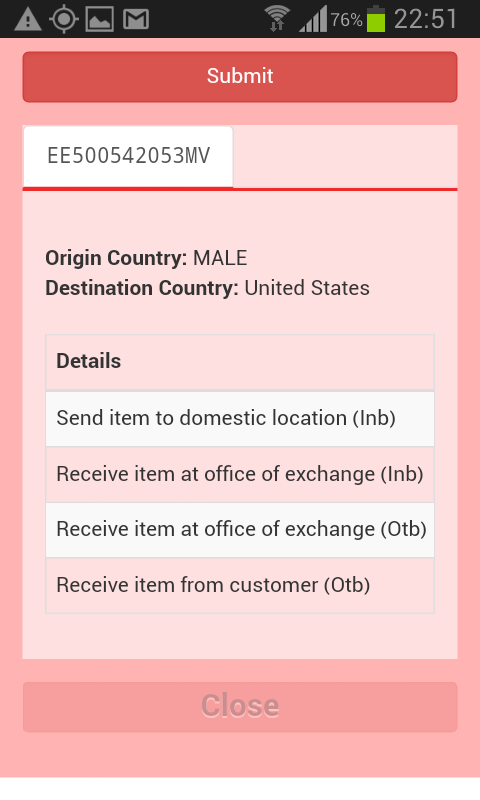 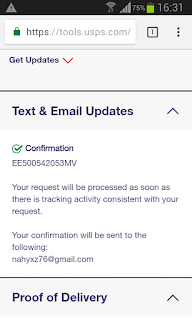 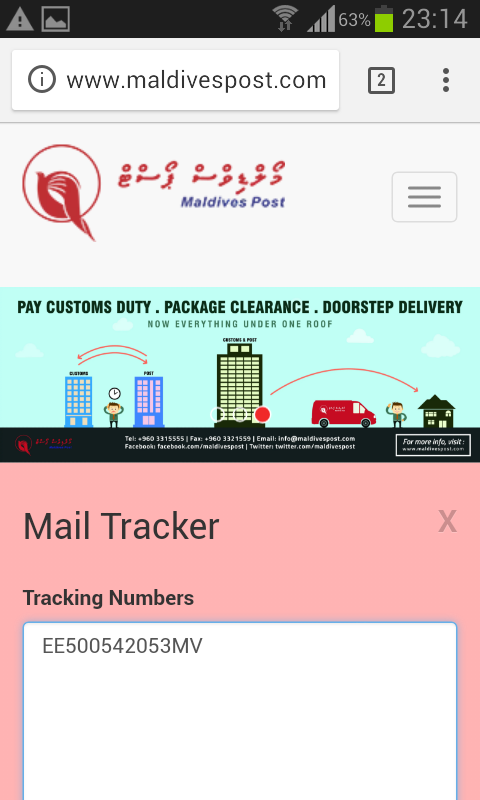 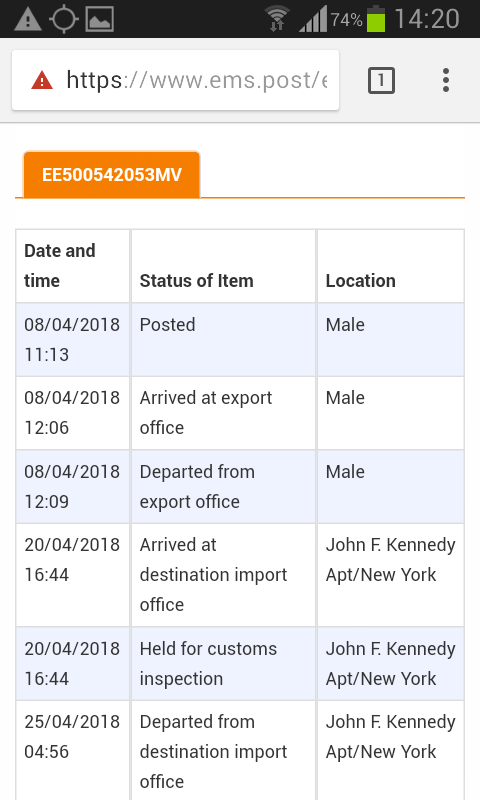 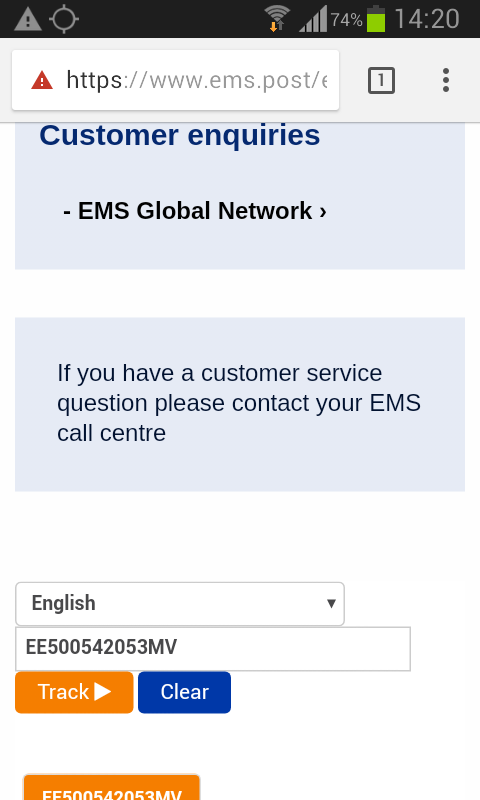 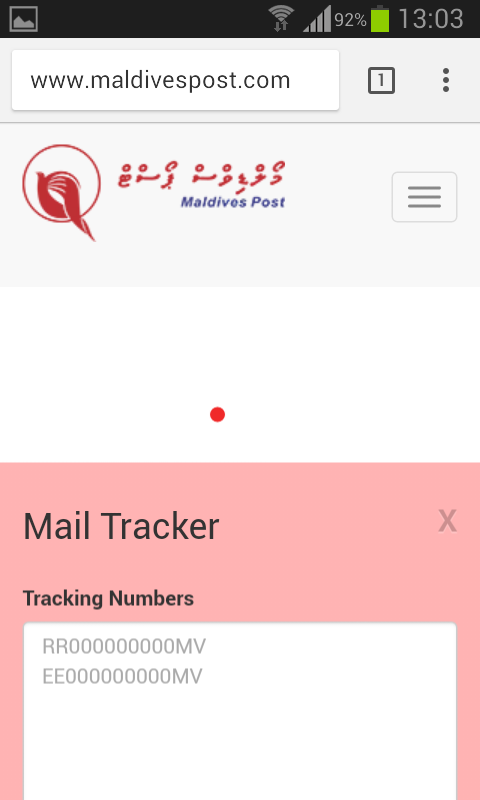 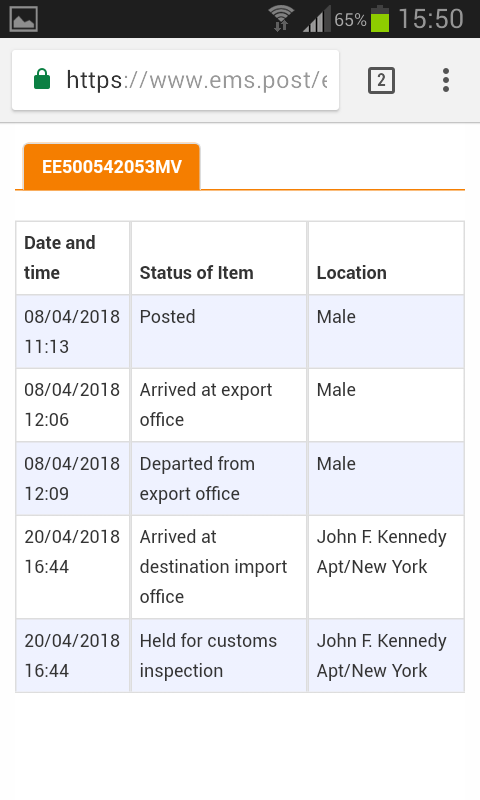 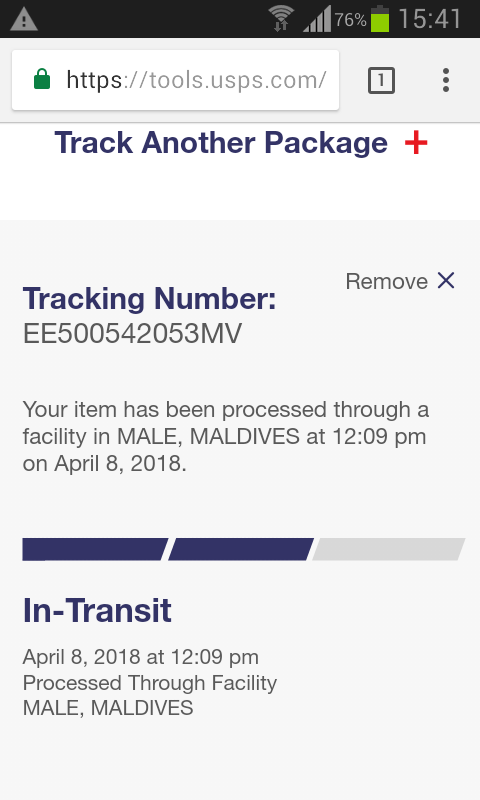 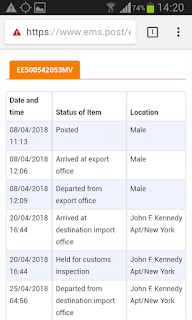 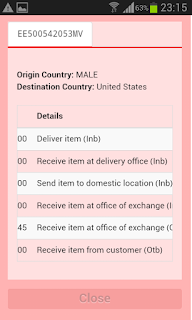 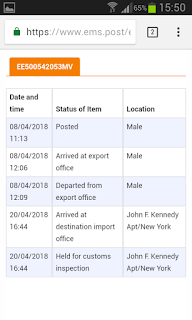 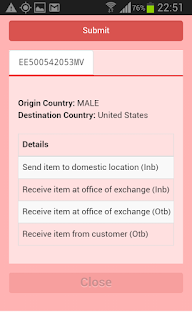 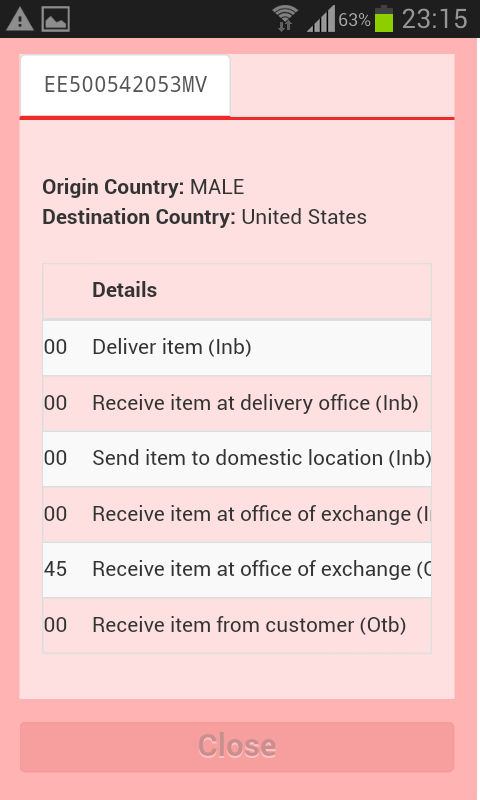 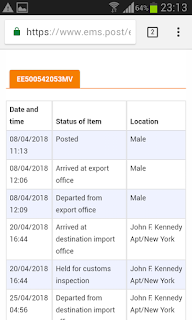 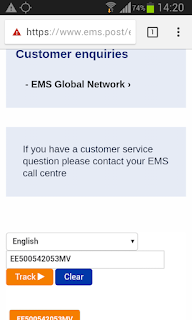 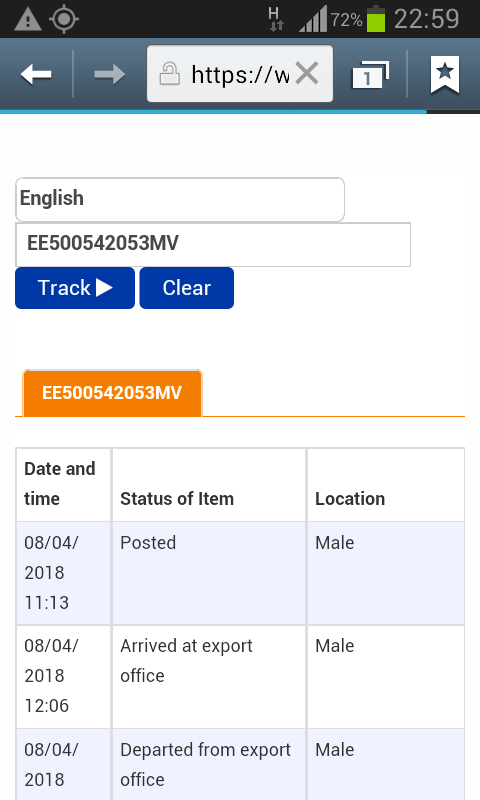 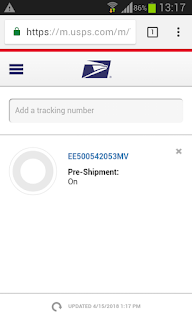 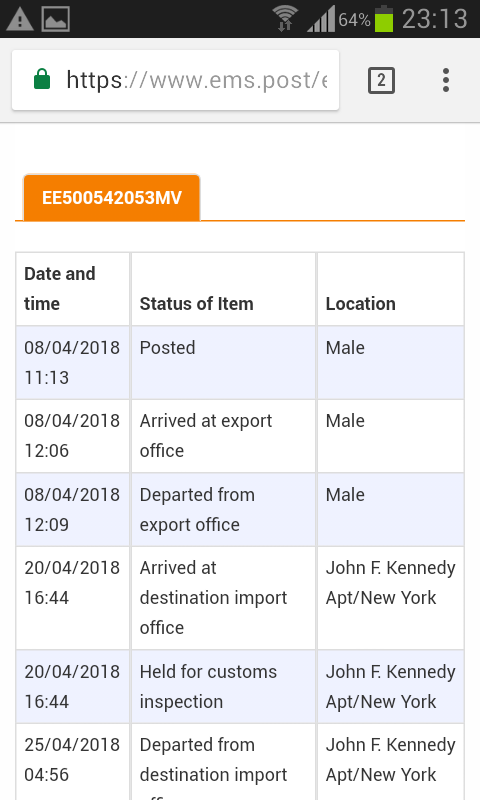 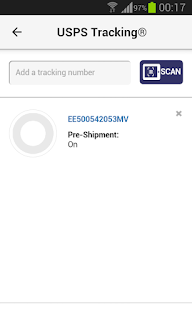 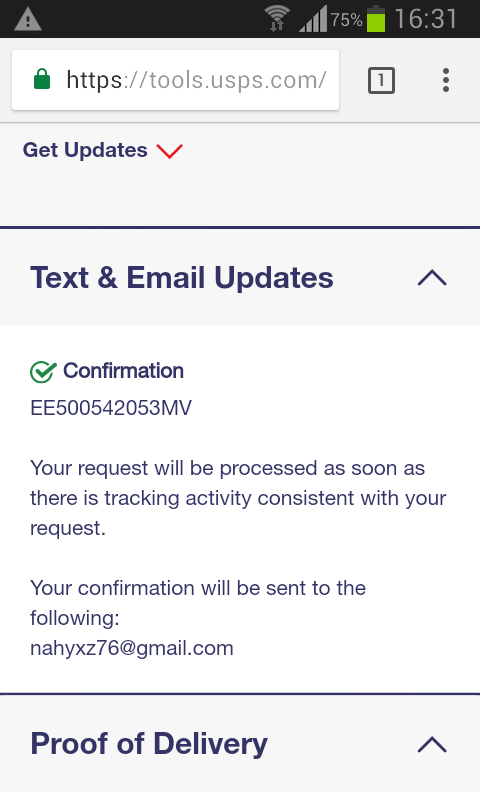 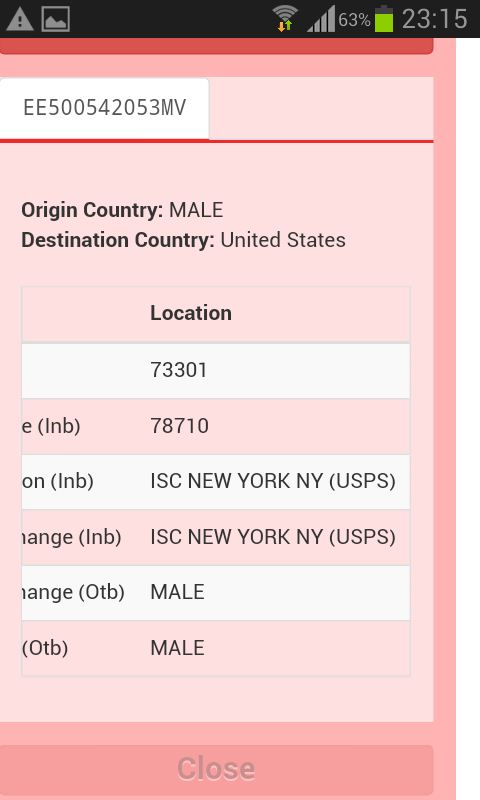 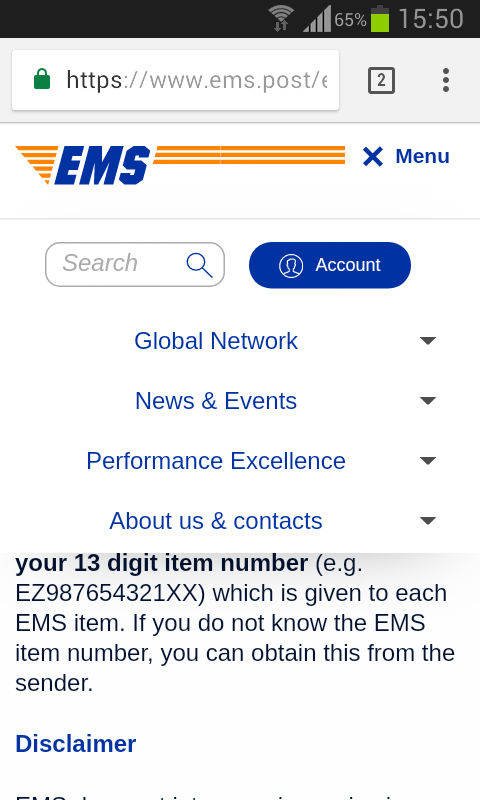 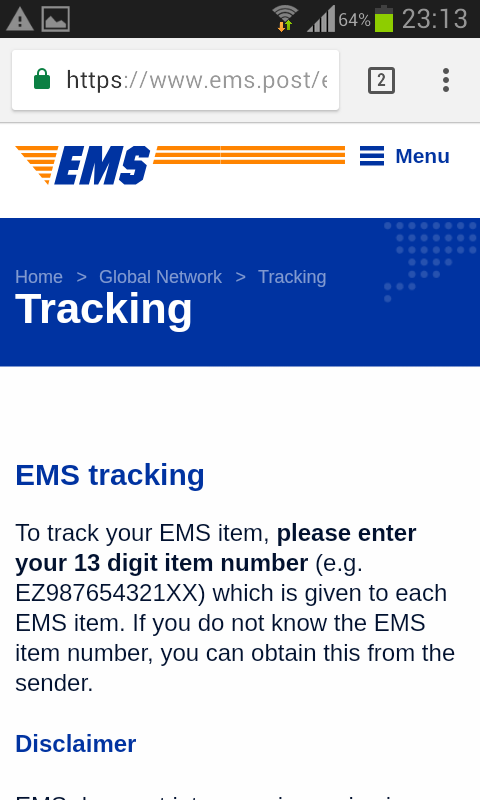 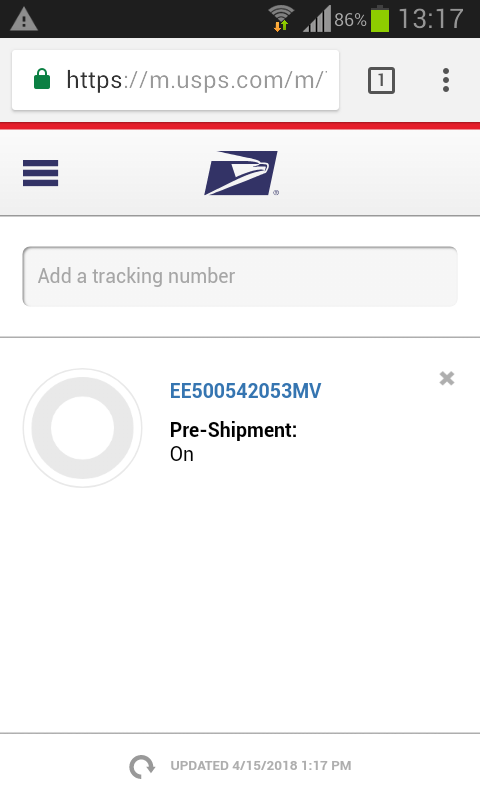 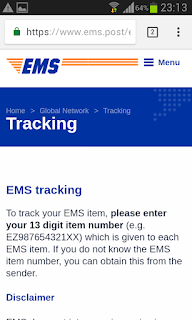 The girl who accepted my parcel for shipping issued the tracking number : EE500542053MV but I was surprised when it was instantly entered into the postal system of USPS®.It was also tracked in Maldives Post website and the website of EMS. 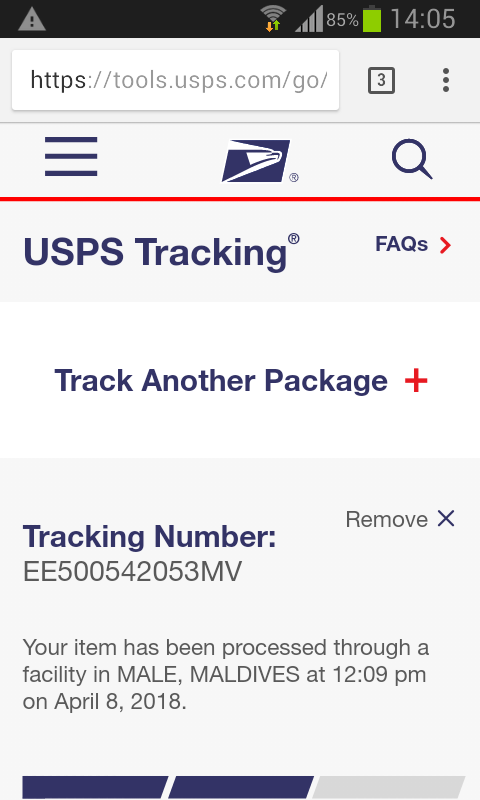 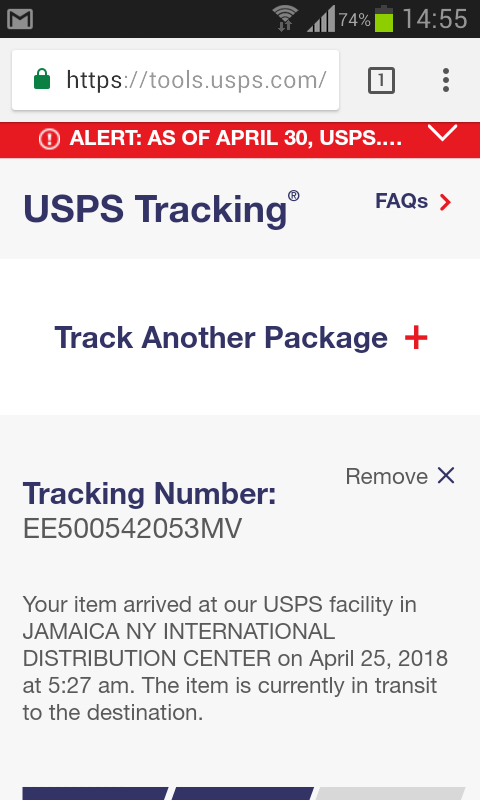 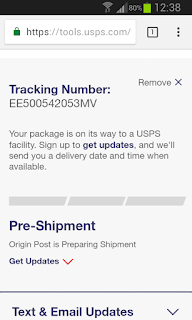 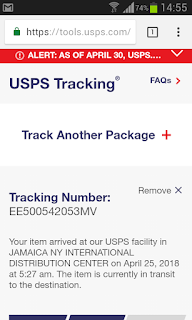 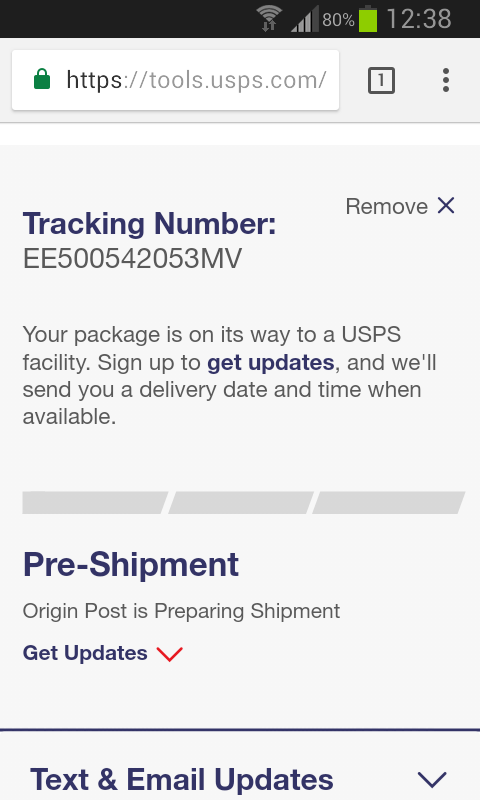 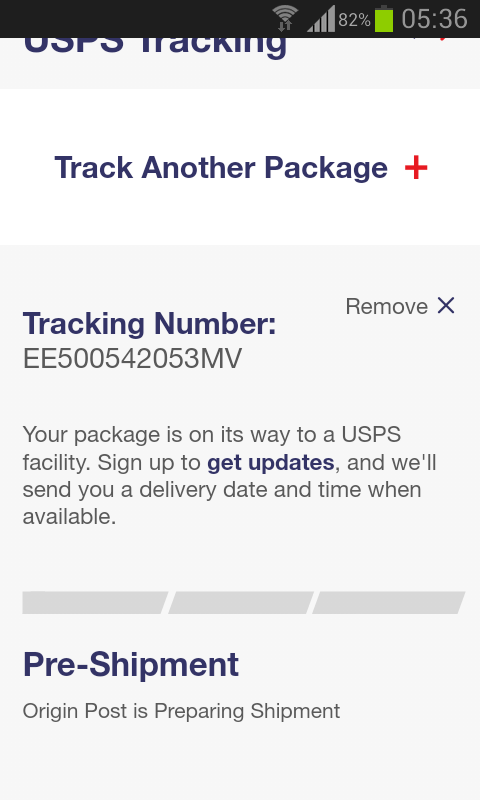 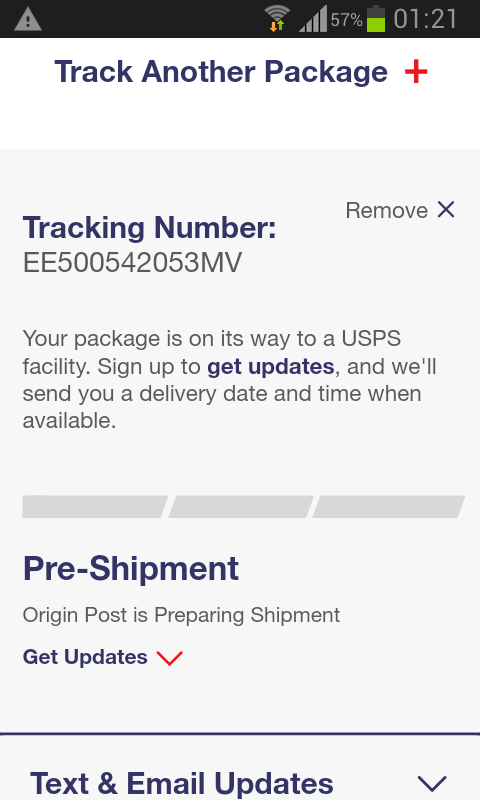 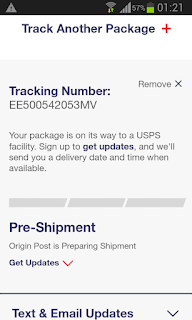 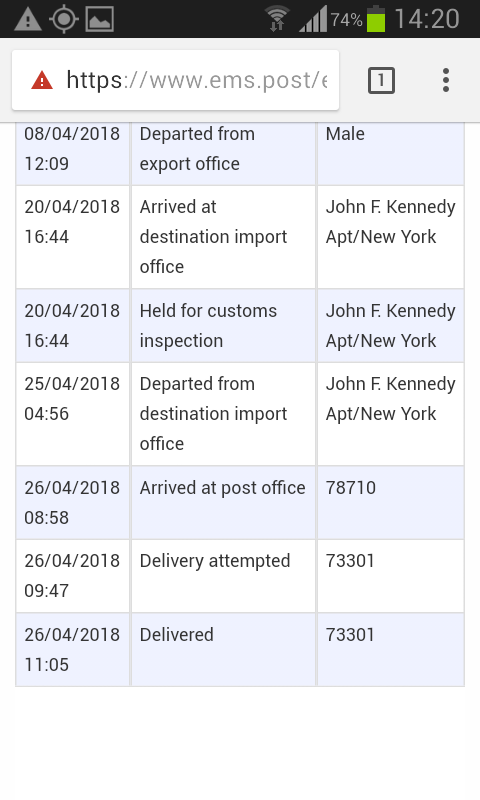 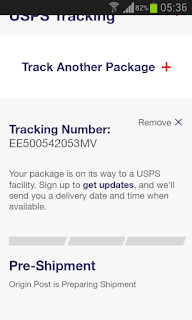 With in 12 hours my package arrived at USPS® sorting facility in John F. Keneddy Airport and was held in US Customs inspection. 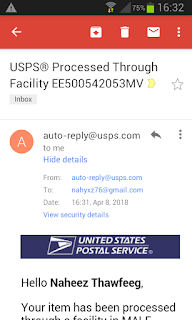 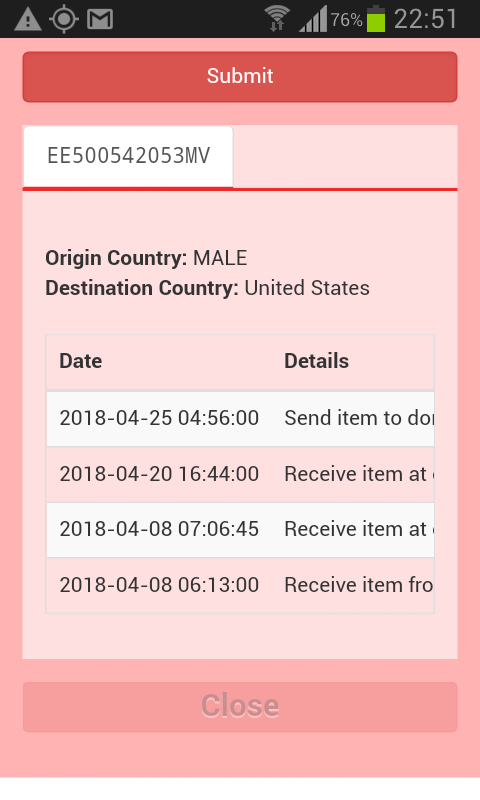 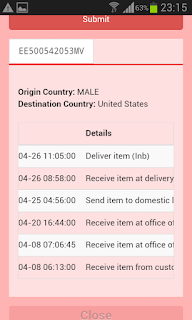 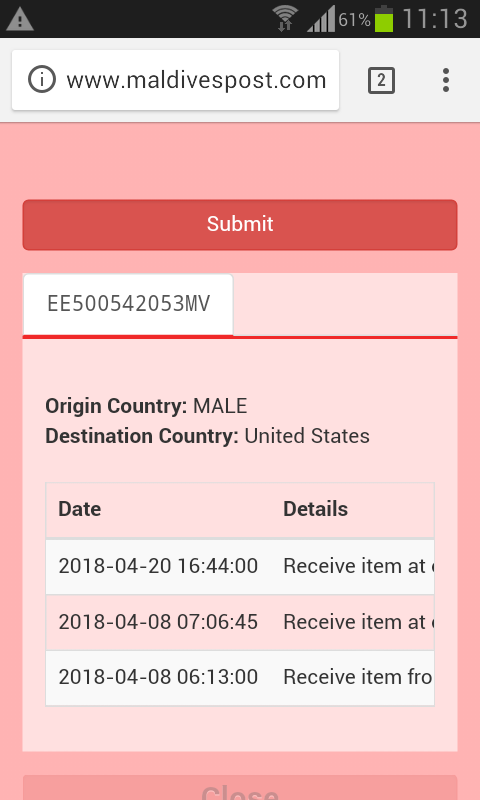 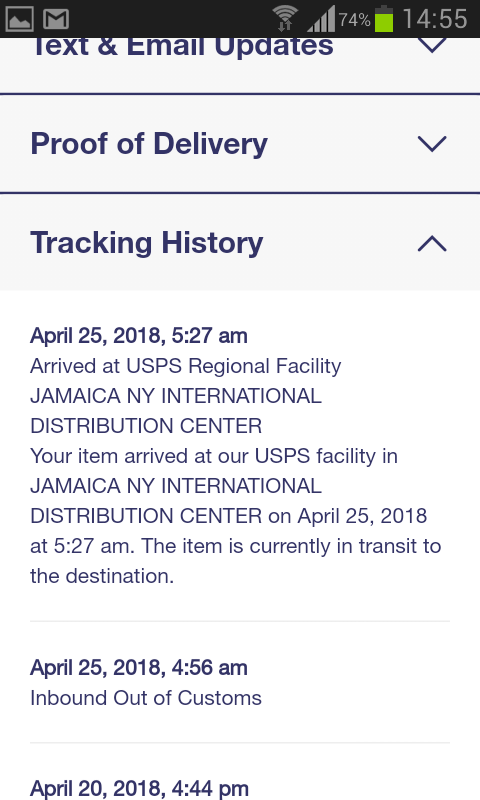 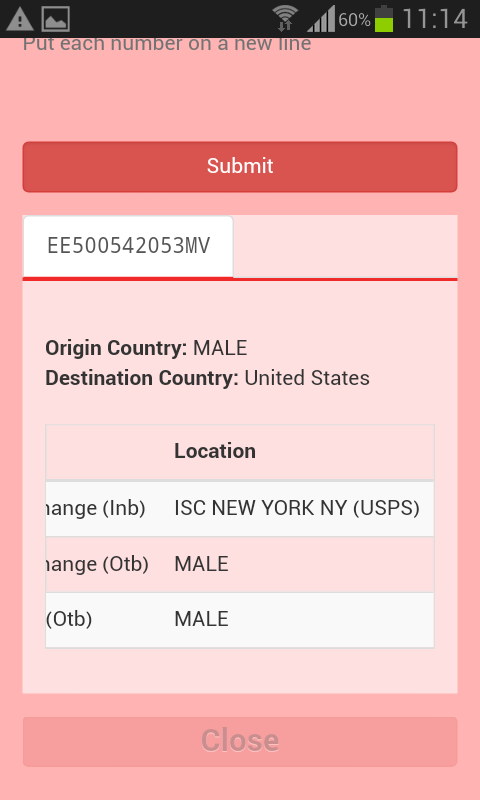 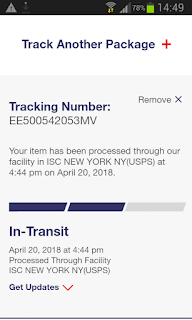 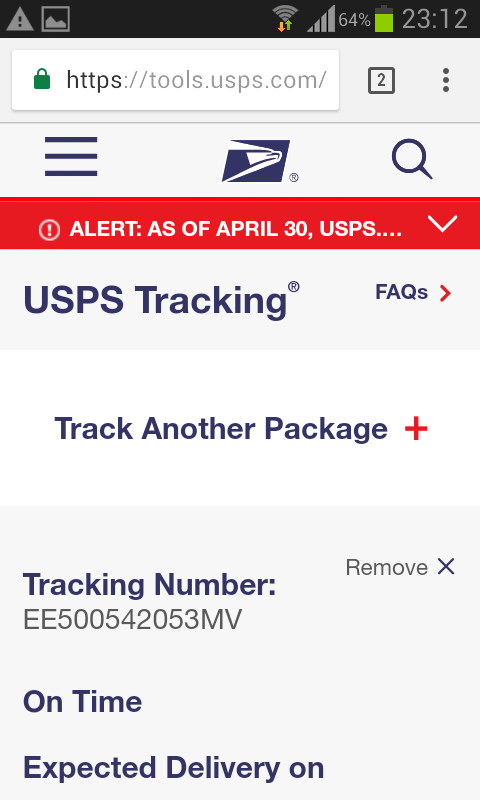 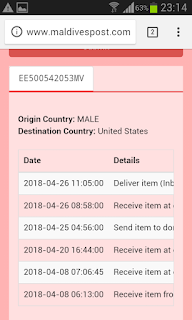 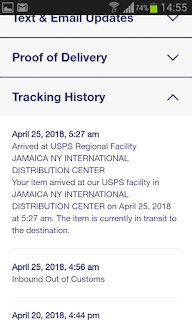 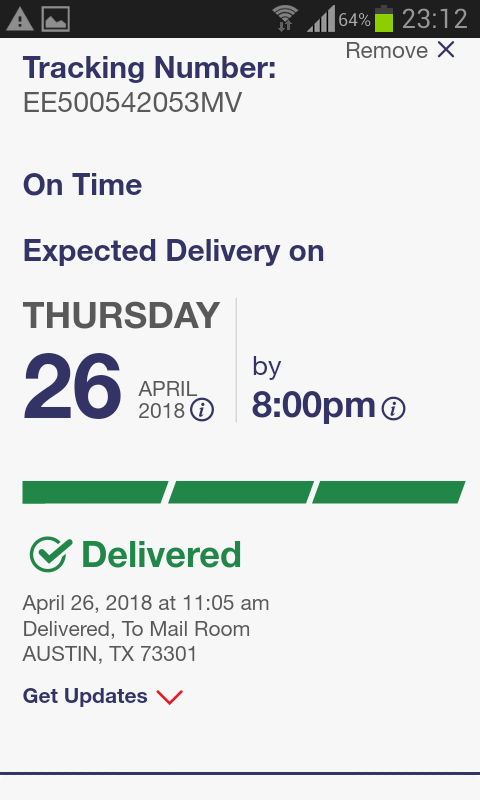 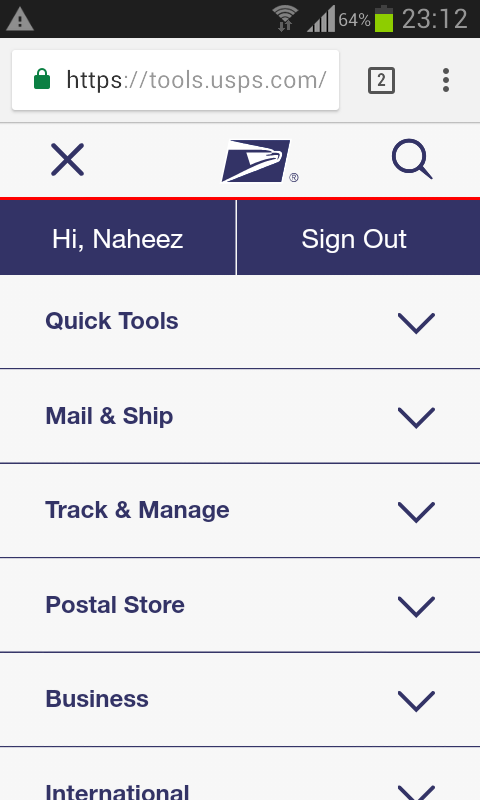 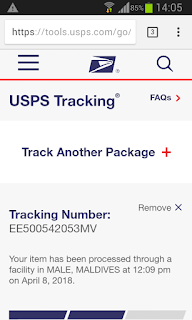 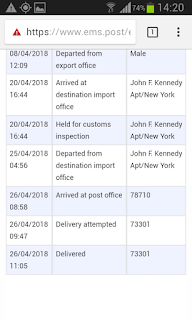 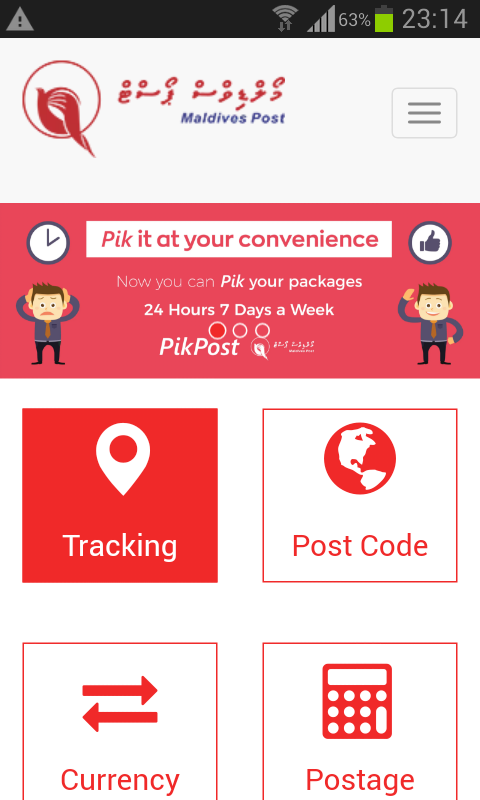 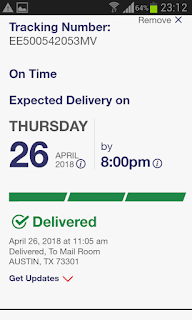 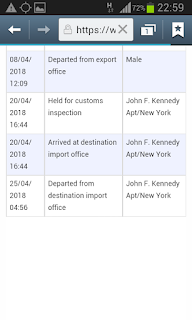 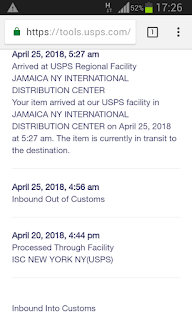 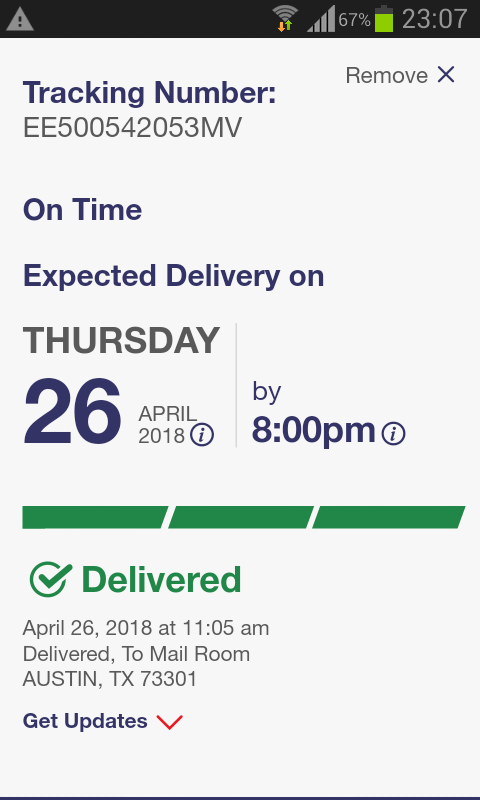 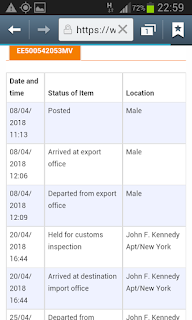 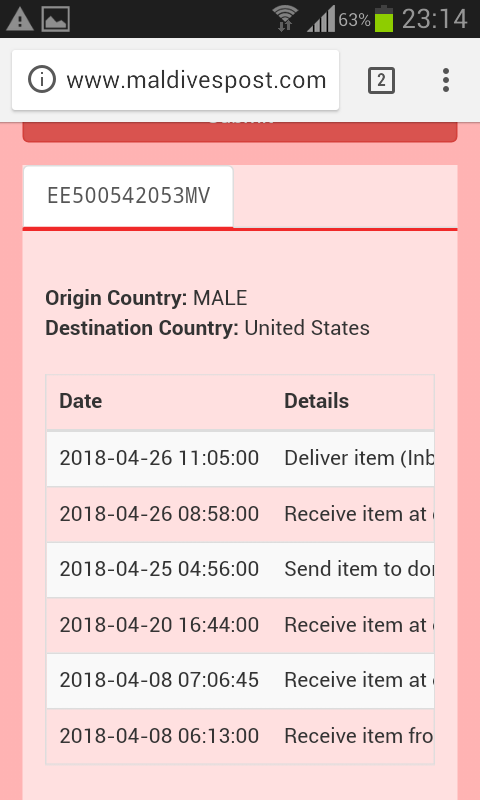 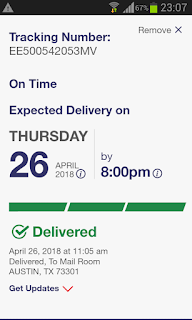 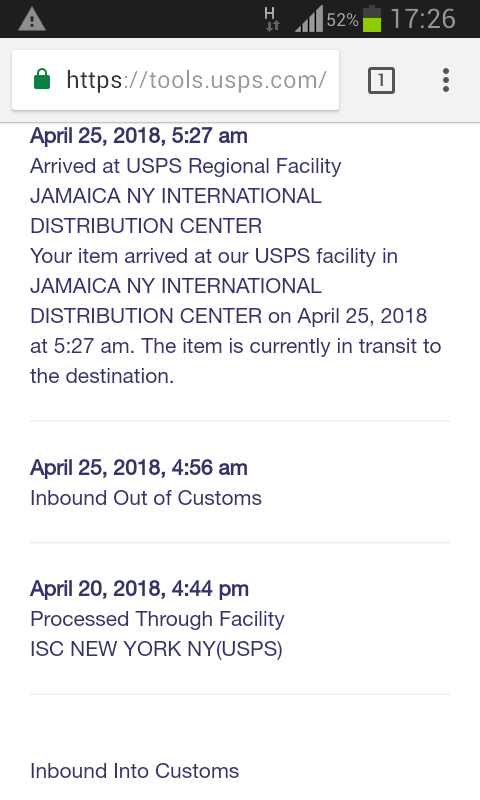 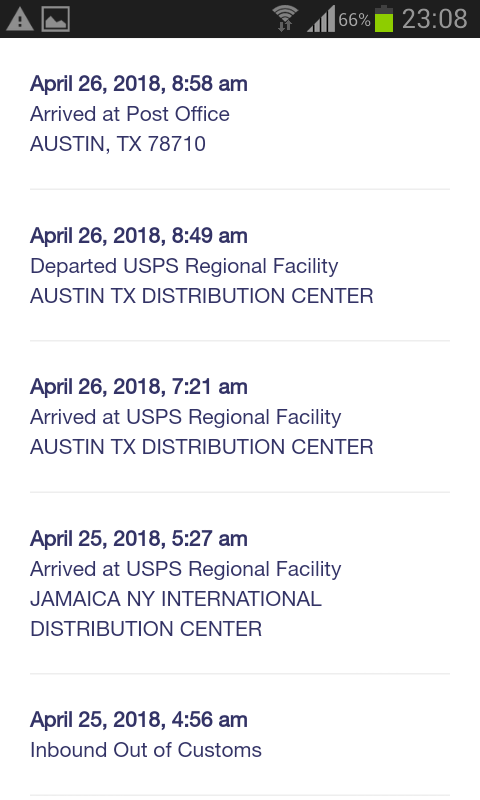 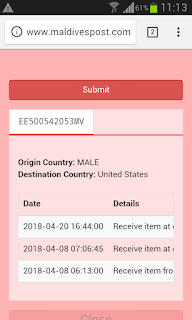 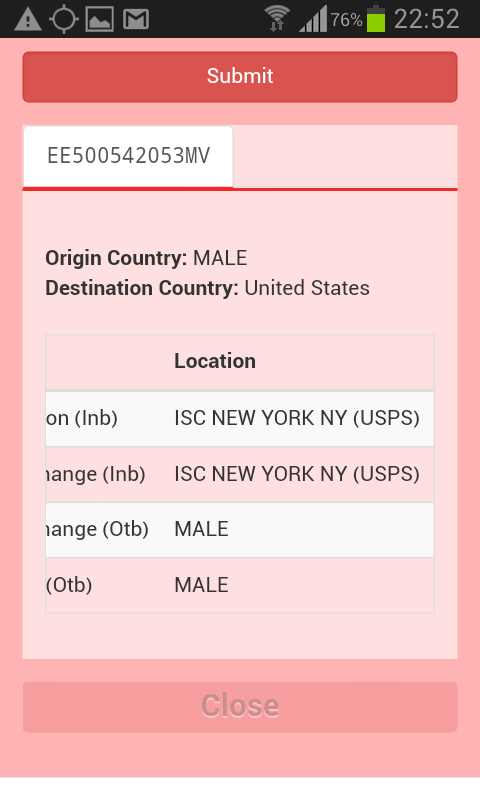 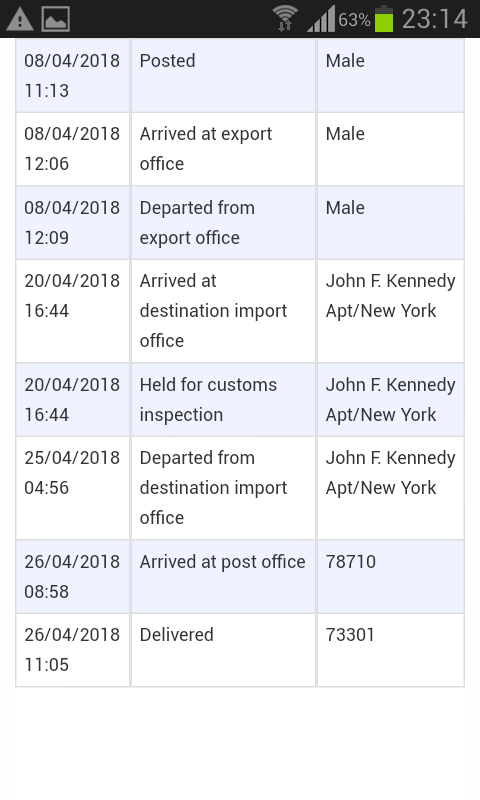 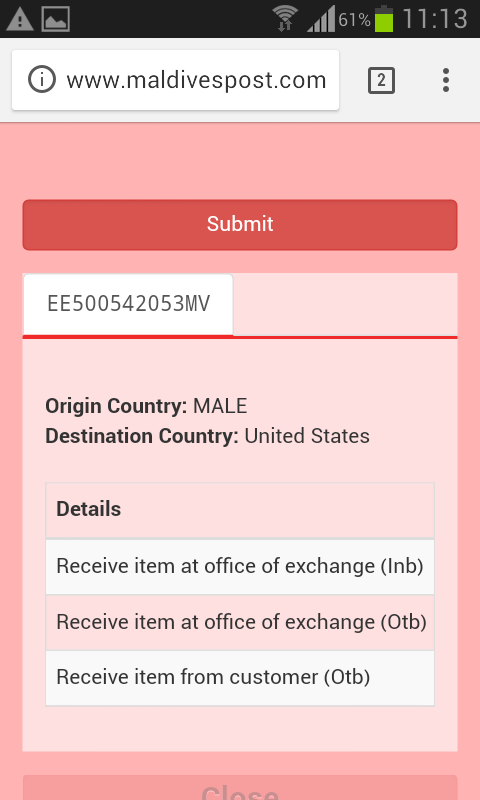 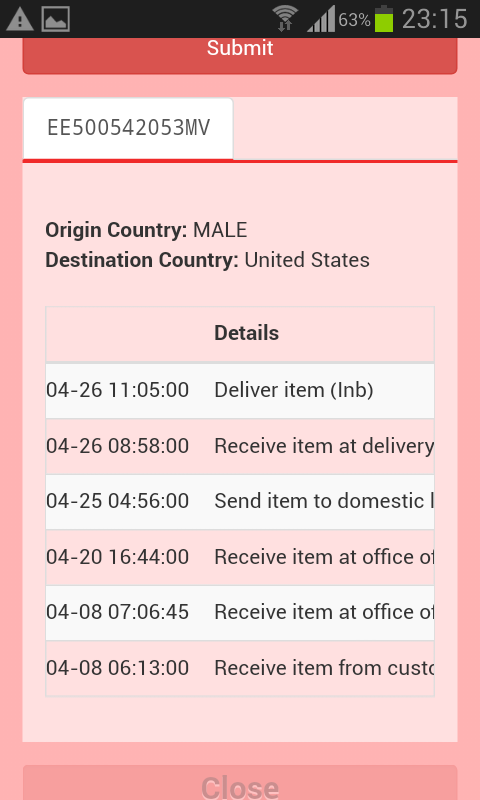 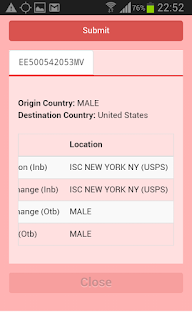 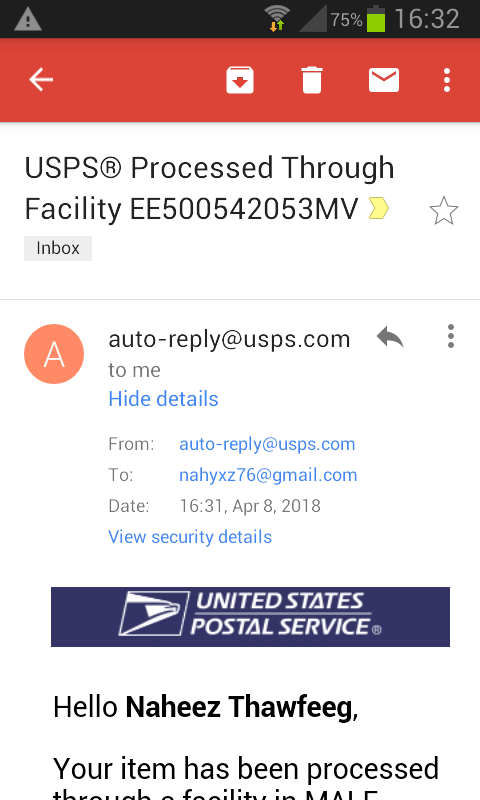 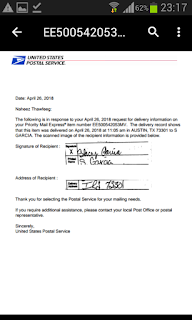 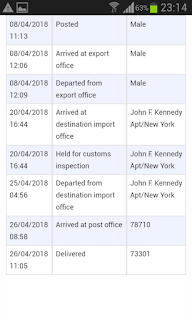 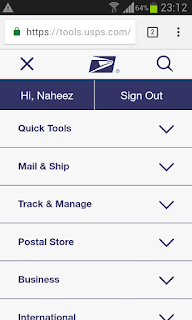 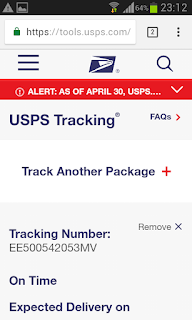 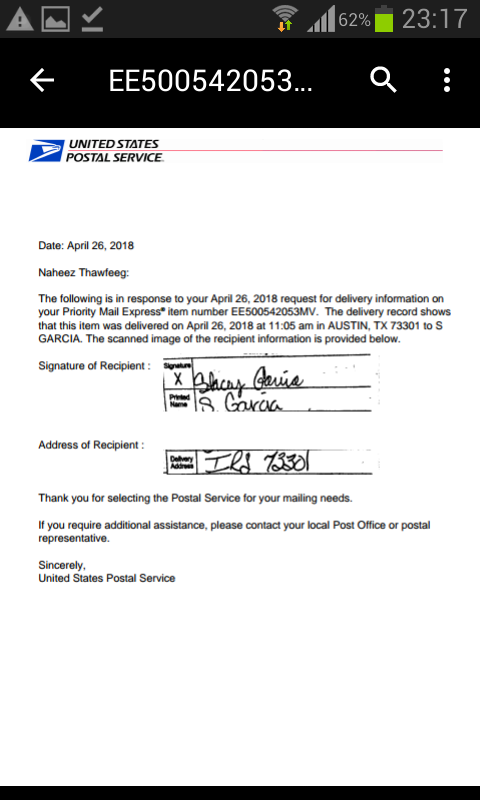 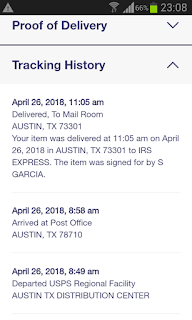 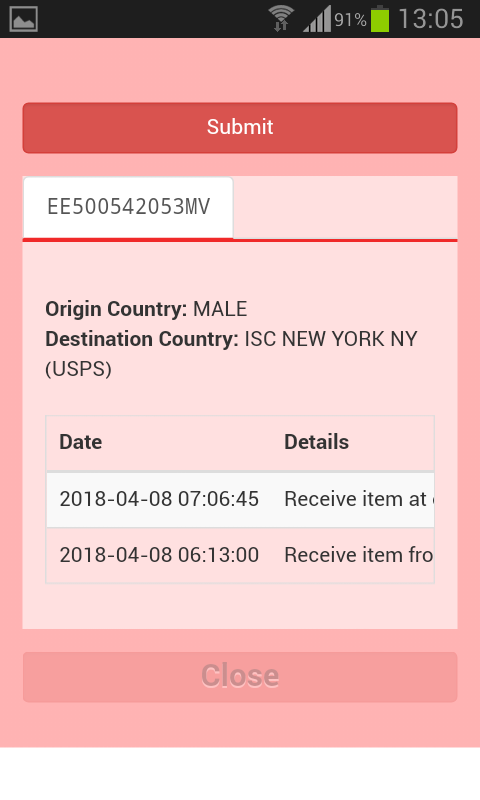 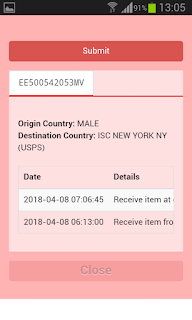 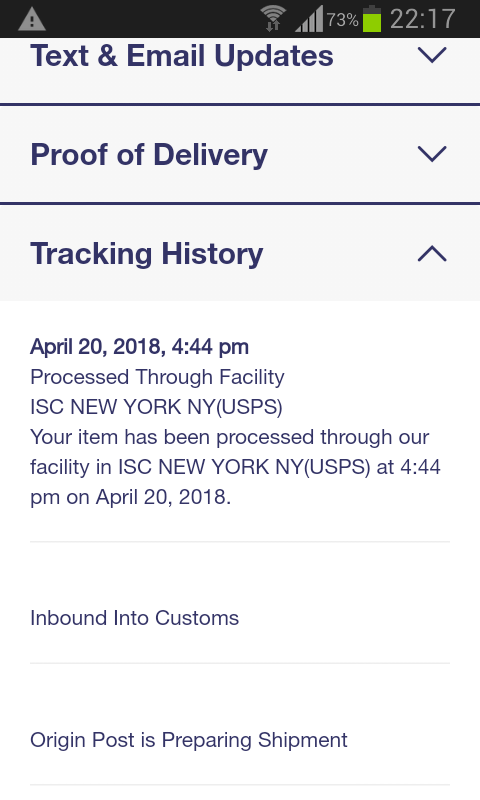 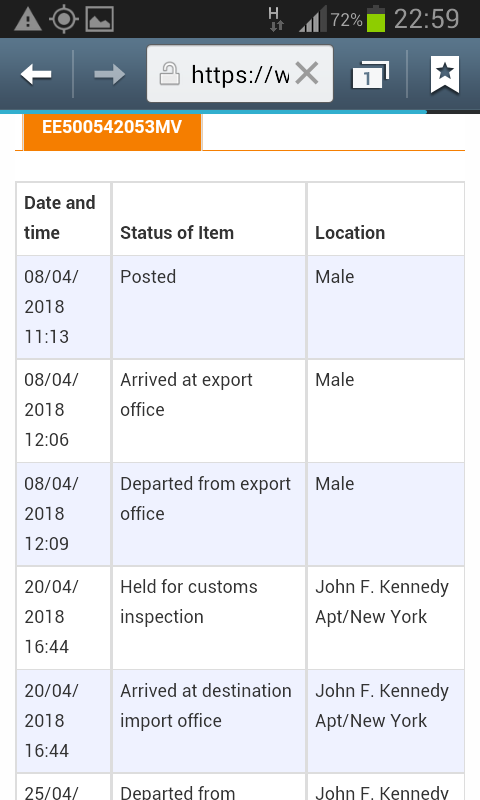 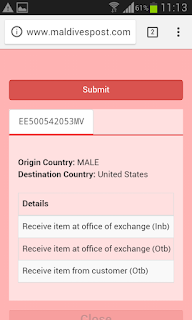 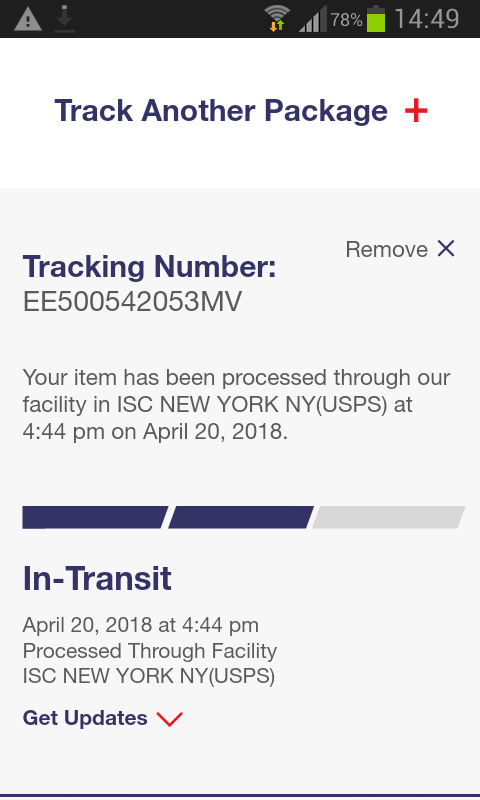 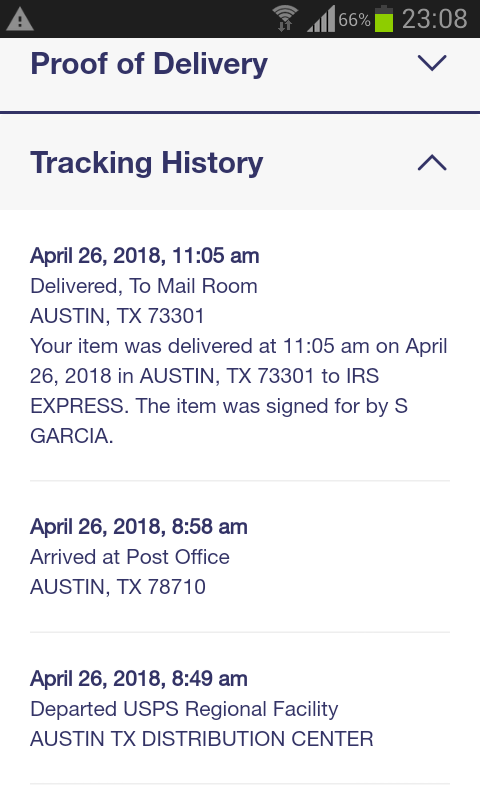 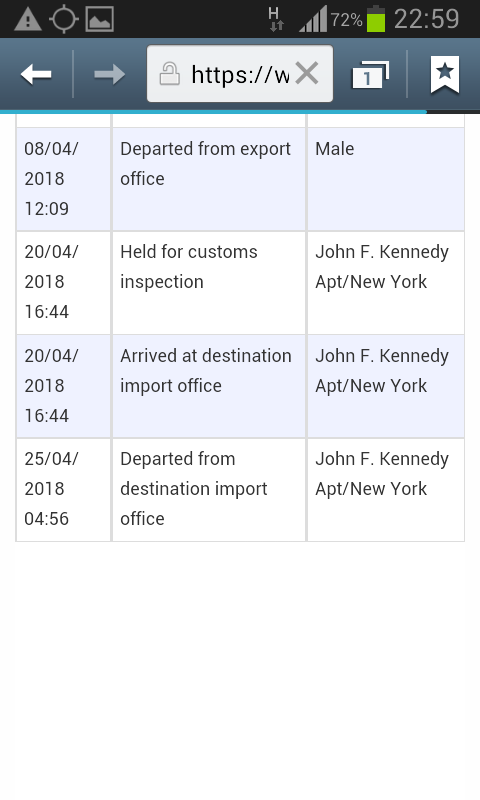 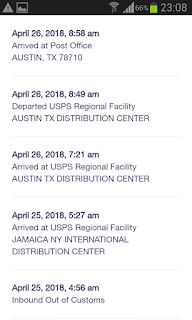 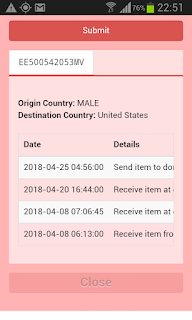 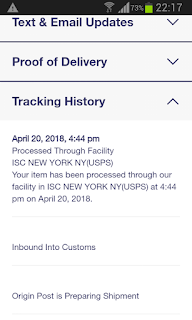 My parcel was held in US Customs for two weeks and than on Thursday 26 April 2018 it was handed over to USPS® and delivered to Internal Revenue Service, Austin, Texas, USA. 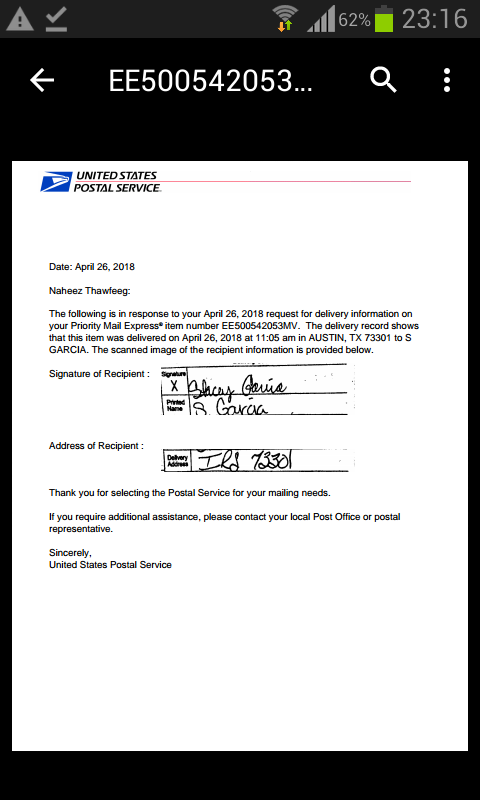 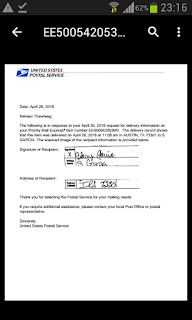 My package for received by S.Garcia and with her signature and USPS® provide me the confirmation proof. 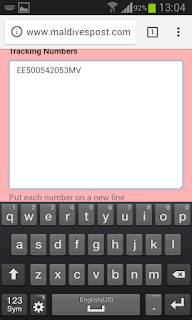 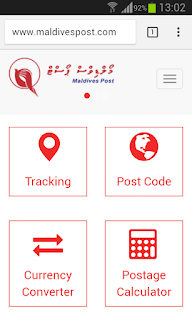 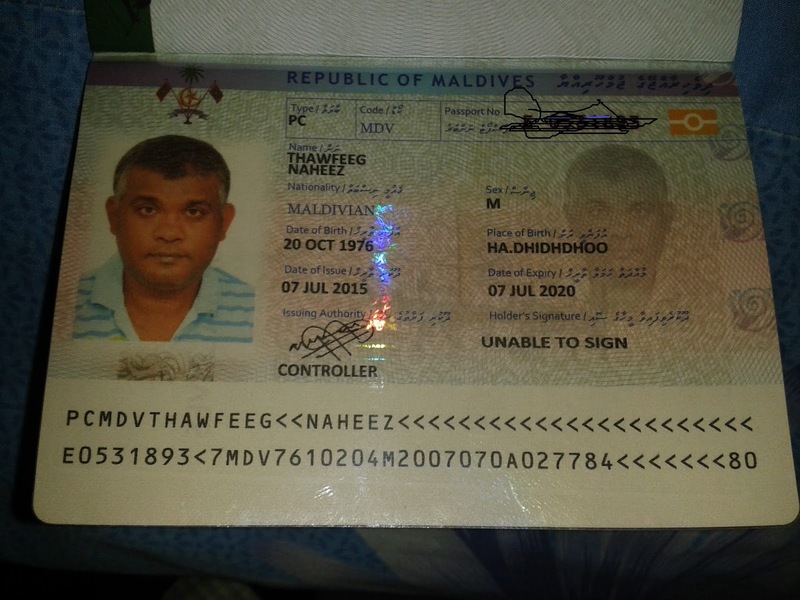 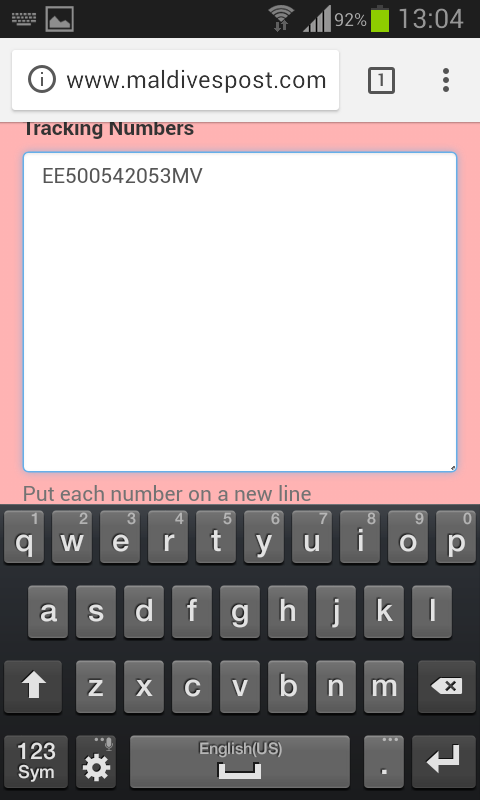 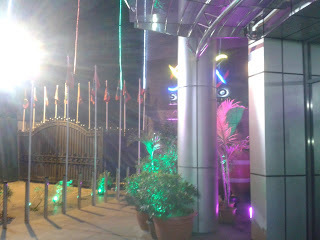 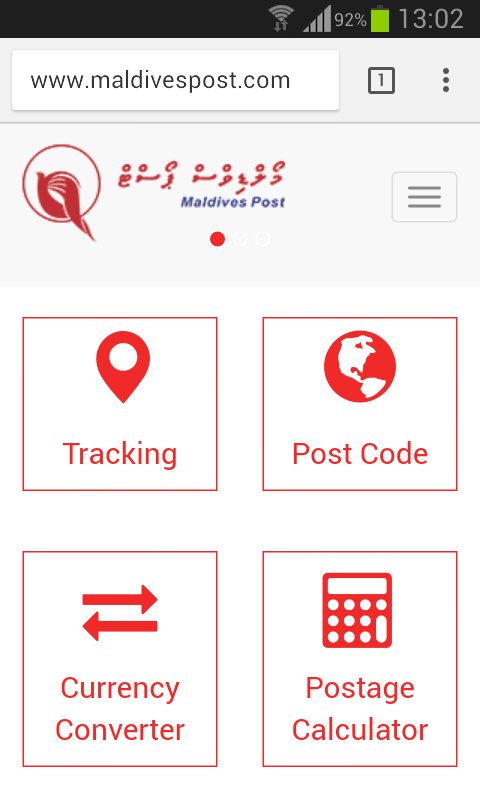 (Maldivian equivalent is National Identity Card Number). 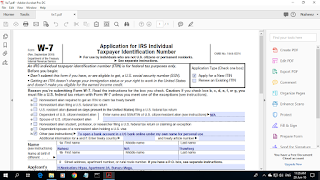 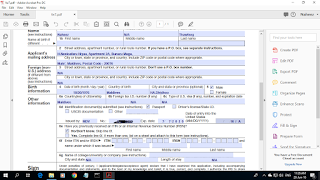 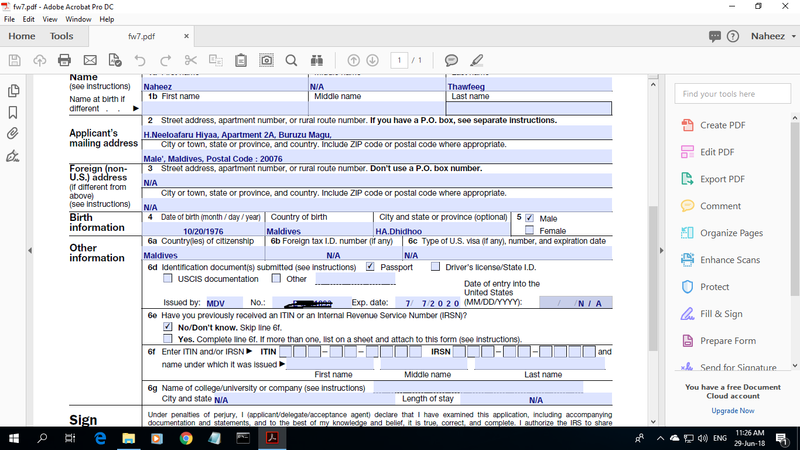 I kept making phone calls to IRS all these past months but my ITIN application was rejected because I am not required tofile tax returns at IRS and they told me my case has been opened in their systems and I will receive my original passport with a personal letter from IRS before 1 August 2018. 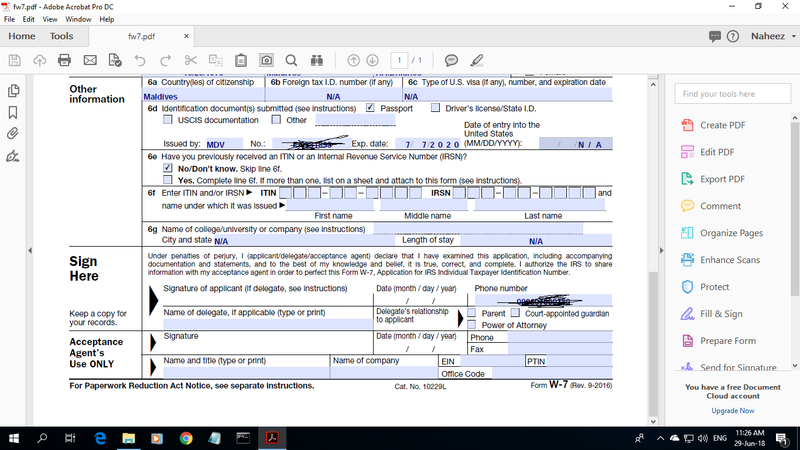 They also told me that my application for ITIN was rejected on 1 June 2018 (during Ramallan this year 2018). 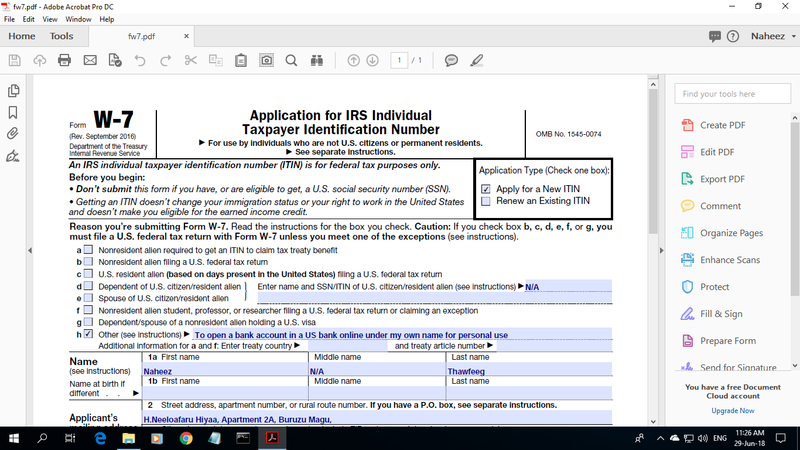 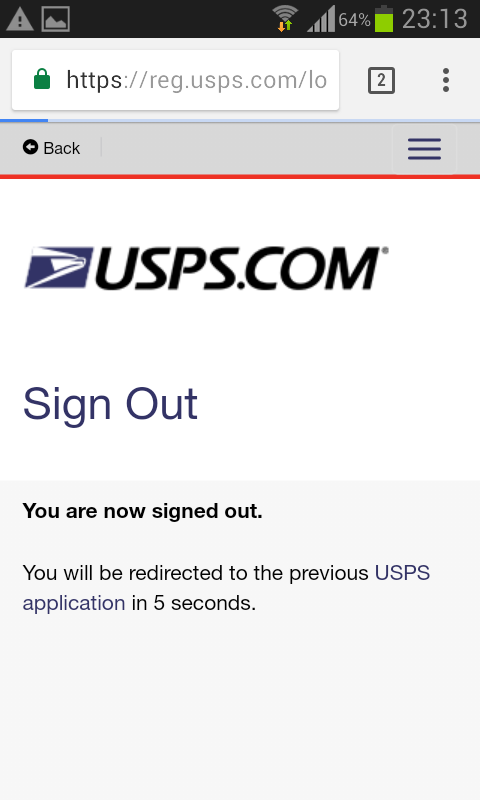 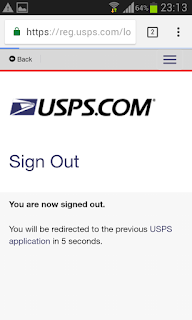 I am now waiting to receive the letter from IRS and start over again to open a bank account in a US bank.